The MK-Diamond MK-101 Pro24 Wet Tile Saw is able to accommodate 6" and 8" profile wheels. Engine: 2 hp, 120V Baldor motor. Rip Cut Length: Up to 24". Diagonal Cut Length: Up to 18". Blade shaft bearings are permanently lubricated and dual sealed. Equipped with a built-in water distribution system. Cutting head height can be adjusted for smaller blades and plunge cuts. Easily removed blades with help from the blade shaft lock. Guide bar and linear-bearing assembly for accurate alignment and cutting. 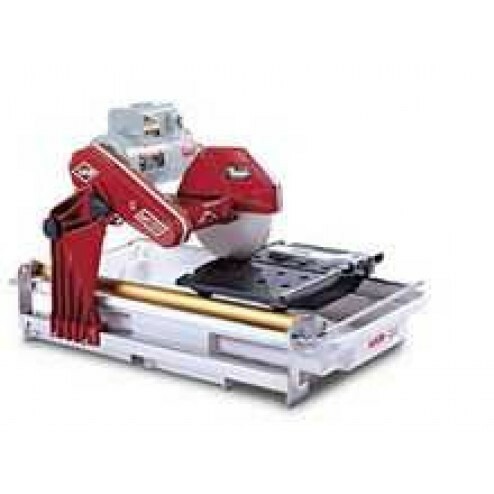 Motor post and cutting head are multi-positional for cutting various sizes. Features a micro V-belt drive. Inlcudes 10" MK-225 HotDog Blade, water pump, cutting kit, side extension table and a folding saw stand with casters.